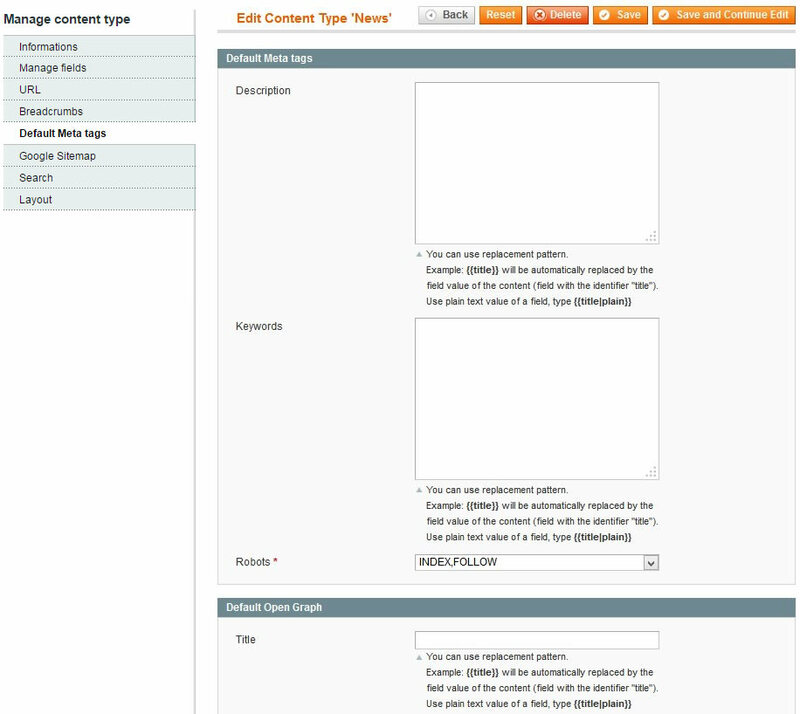 To create a new content type, mouse over “Content Manager” menu in the admin, then click on “Manage content types”. This page will list all your existing content types. To add a new one, click on “Add Content Type” button in the top right corner. The first tab is called information, these informations are for admin purposes and won’t be directly shown on frontend. Title: Name of your content. For admin purpose. Identifier: Unique ID which identify your content type. This key will be used to create list of contents, and is also used for template redefinition. Description: Description is also used in admin only, this is a reminder text for admin users that define what this content type is used for. Before being able to create fields, you must save your content type once. This field define the default title that will be suggested when you will create a new content. You can use replacement patterns to auto-build your title. This area allow you to create all your fields. These fields will create the form structure of your content, subsequently available in the CMS → Your content section. For readability purpose, you can group your fields by fieldset. Click on Add field button to create a new field in the corresponding fieldset. You can drag and drop your fields between fieldsets, or themselves by using the dotted left border. Input Type: Define the type of the field, click here to have details for each field type. Is Required: Define is the field will be a required field when creating a new content. Note: A note which will be displayed under the field to help the webmaster, or give information about this field. This tab is used for certain field type for extra configurations. e.g. to add option/value to a “select” field, or to activate the WYSIWYG for a textarea. This tab is displayed if you set your content to be searchable (main Search tab). Save your content as searchable to view this tab on the fields. You can define which fields are indexed for the search, and their weight. Be careful, more you have indexed fields, more your search results will slow down. Click here to have complete information about search feature. This section define the default url that will be suggested when you will create a new content. You can use replacement patterns to auto-build your URL. For example, if you have a field named “firstname”, another one named “lastname” and you are creating a testimonial content type. Use “|plain” to have the plain value of the attribute, otherwise it won’t replace special characters and you could have an non-accessible URL. This section define the default meta tags fields that will be suggested when you will create a new content. You can use replacement patterns to auto-build your meta-tags. Use “|plain” to have the plain value of the attribute, otherwise it won’t replace special characters. This section allow to set: Meta description, meta keywords, robots and open graph tags. Enable the feature, set the priority and update frequency to be included in your Google Sitemap XML file. This section define if your content is searchable or not. Set it to yes and then click on “Save and Continue Edit” button. 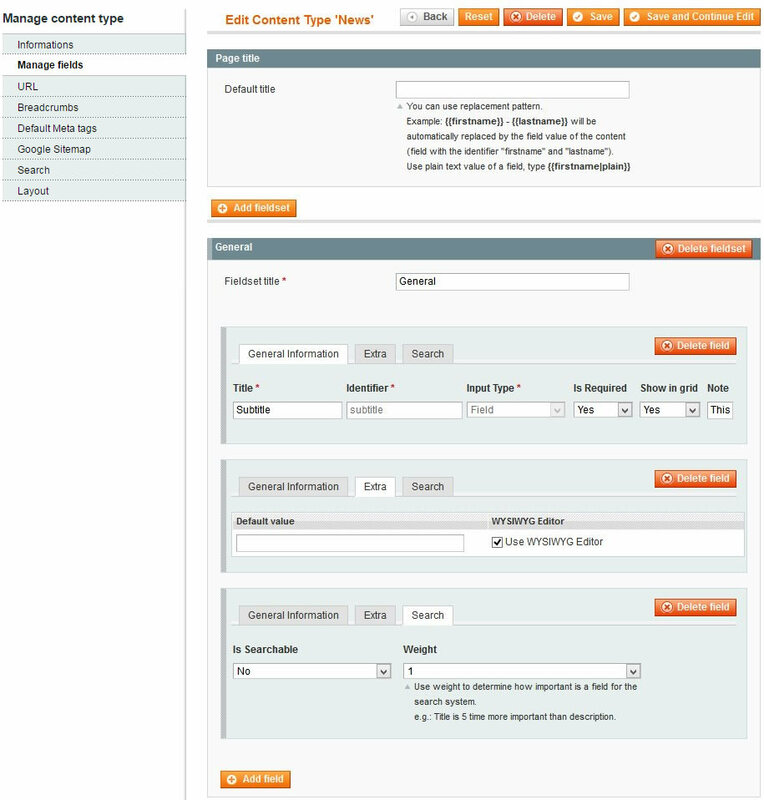 It will add a new tab for each fields to define which of them are indexed. This section handle the layout of your content: the way it will be displayed on frontend. Click here to read the documentation about layout.